When we ingest a food such as sardines that have a high RNA content we are most likely eating all one hundred thousand to over one million different RNAs. Similarly, when we take a total RNA supplement, we are again absorbing all of the one million different RNAs in this mixture. If we think of each of these RNAs as children, all dashing to get through one doorway at the same time when the recess bell rings, you can begin to see why these total mixtures of RNA are not always effective. Or why eating sardines is just not the answer. The various children will be competing with each other to get through the door just as the various different RNAs will be competing to get into your cells. If we now put a time limit on how long the door is open, we begin to restrict the number of children that are able to get through the door for recess. On any given day one child or another child may get through the door for recess. There is no guarantee that any particular child will go through the door on any given day. Your cells also limit the transport of RNA into their cells so that on any given day it will be a random event in terms of which RNAs that you have ingested will be taken into your cells. As we will see in a moment, different cells may require different RNAs to help to balance them depending on their particular environmental, microbial, or genetic conditions so that a totally random sampling of RNAs may not be of optimal benefit to the cells. If we go back to looking at RNA we may be talking about one million different variables. 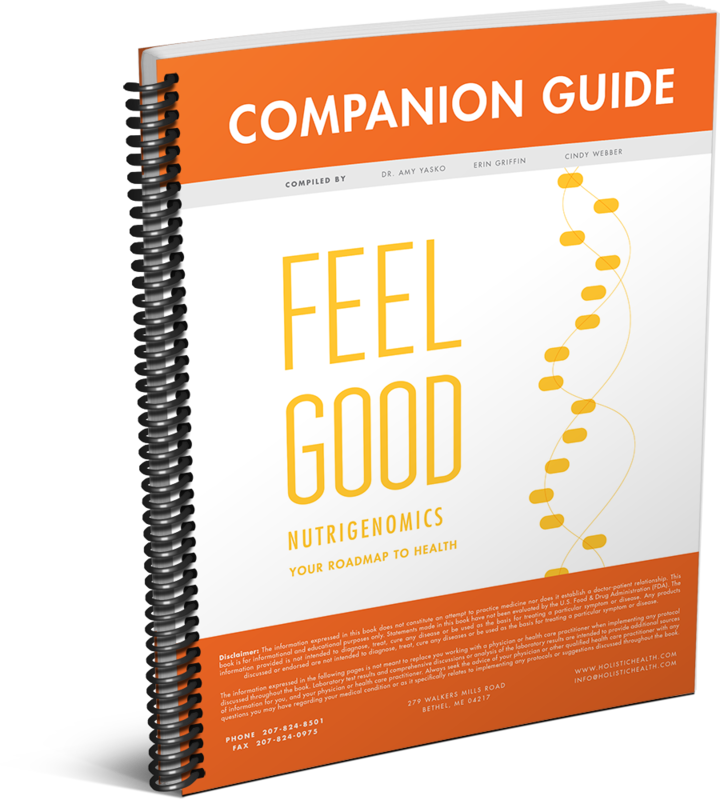 It would be virtually impossible to be able to select the correct foods in order to appropriately supplement your body’s specific RNA needs. Your lifestyle and choice of diet may influence the RNAs that your body needs, making the scenario even more complex. As you will have realized by this point, every cell in our body contains RNA. Plant cells, yeast cells and animal cells all contain RNA. The natural RNA in our cells encompasses all types of RNA including the most abundant ribosomal RNA, messenger RNA, transfer RNA and noncoding RNAs. 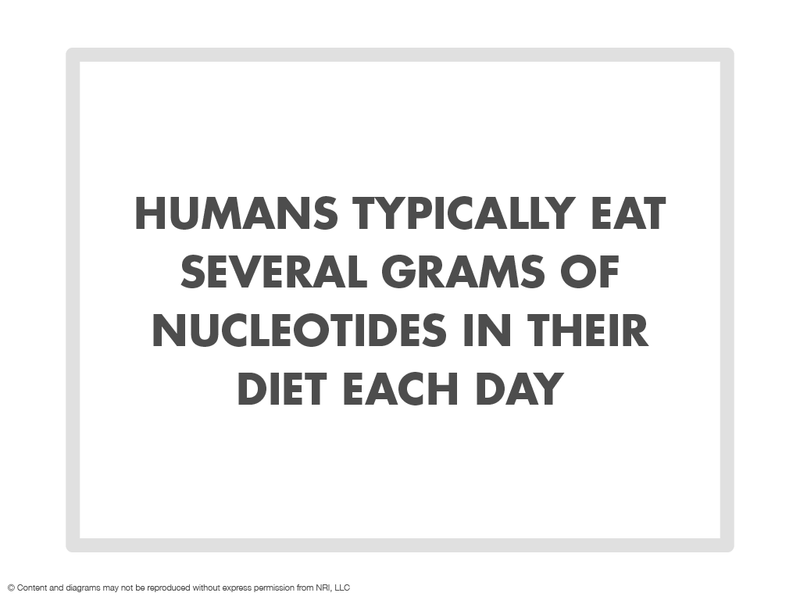 We typically eat several grams of RNA in our diet daily. Total yeast RNA (which contains only RNA and no yeast) has been used for a long time as a nutritional source of total RNA. RNA is safe enough to be added to baby formula. Breast milk contains large quantities of RNA and specialized intravenous infusions containing RNA are given to high risk patients before surgery. These RNAs, as well as the highly specific RNAs nucleotide blends will safely break down in the digestive tract just like food. RNA is an important nutrient involved in cell multiplication and development in every organ or tissue in the body. Ordinarily, the body breaks down any ingested RNA that is not used into purines and pyrimidines – the basic components or nucleotides of RNA. The digestion of RNA also releases the sugar backbone, ribose, which can be envisioned as the “string” that holds the beads of our necklace together. You will remember that the purines and pyrimidines were the names given to the plastic snap beads in our RNA necklace. 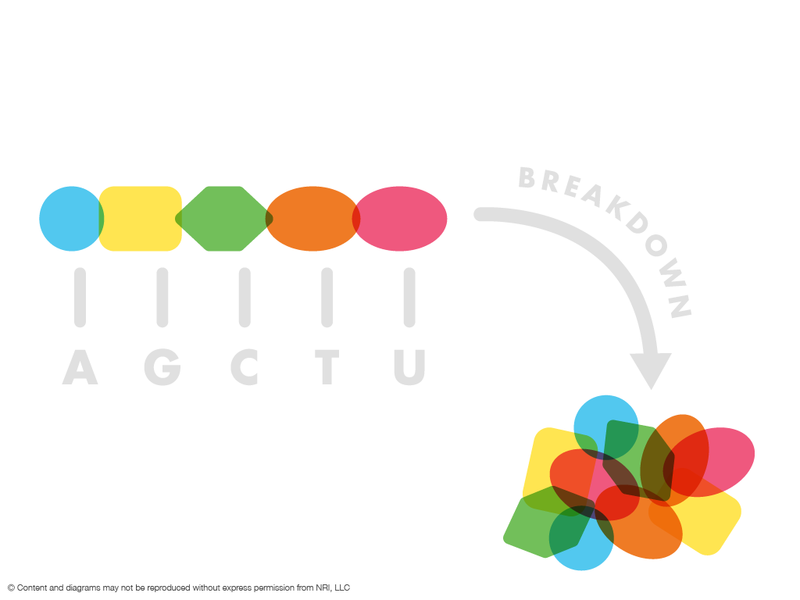 The blue and yellow beads (adenosine and guanine) were the purines, and the green and orange beads (cytosine and thymine) were the pyrimidines for DNA. In RNA, thymine is replaced by uracil (pink bead) as the second pyrimidine. So the two pyrimidines for RNA are cytosine and uracil (green and pink beads). 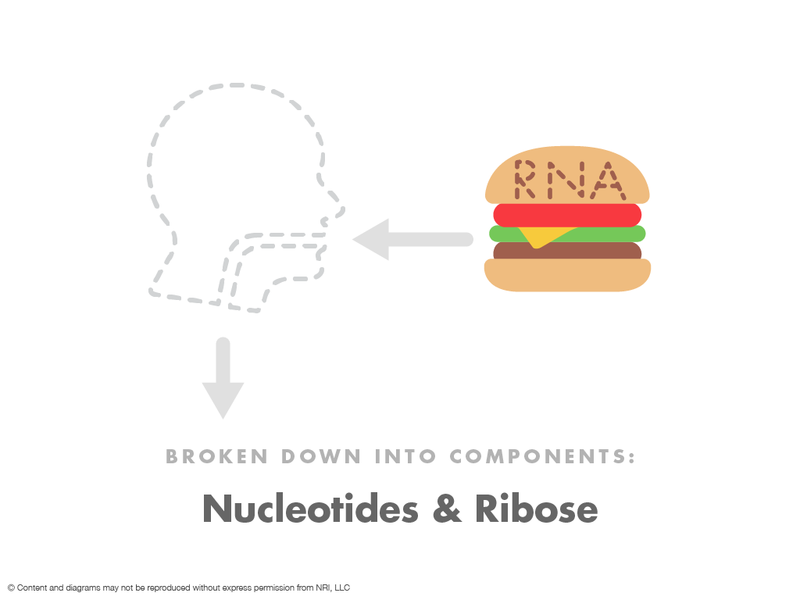 When RNA is eaten and digested into its component parts the actual nutrients that are being absorbed are often referred to as dietary nucleotides. In other words the RNA bases or nucleotides that come from the diet. Dietary sources of RNA include fish and nuts. 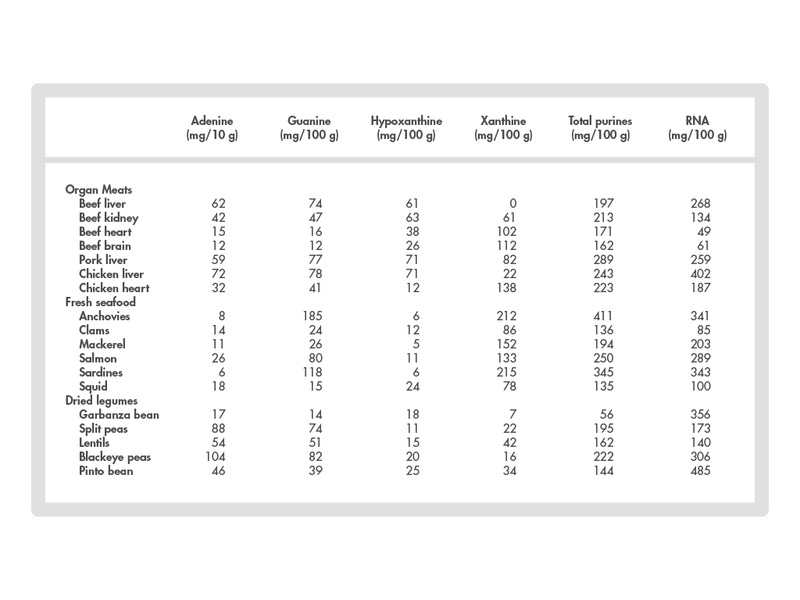 Specifically, foods rich in RNA include seafood, fish, beans, mushrooms, beef, broth and vegetable soups. Sardines are the most potent source containing 1.5 percent nucleic acid versus red meat, which contains only 0.05% nucleic acid.